...but we’ve been busy working. 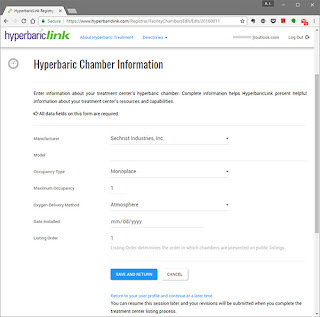 HyperbaricLink has been getting bigger and better since it first appeared on the web in June of 2009. Just a couple weeks ago we rolled out the HyperbaricLink Registry, a major development effort we've been working on for months. The Registry enables hyperbaric treatment centers to provide detailed, updated information about themselves using an efficient interface. As treatment centers join the Registry our directory will have more detailed information about each center and will be able to respond more quickly to the inevitable changes in treatment center staff and capabilities. found more easily in web searches. If you are a treatment center administrator and want to improve your program’s presence on the web, you can get started right now by creating a profile in the Registry and entering your latest information. The complete process takes about 15 minutes. Although our list of blog entries hasn’t grown much lately, our website traffic has. HyperbaricLink now gets over one million page views per year. That’s about four times the annual number of hyperbaric treatments in the US. We’ll be sharing more interesting statistics like this in forthcoming blog posts. We will also have more news to share about our website improvements. The Registry is just the most recent in a long series of advancements. And, of course, we’ll be continuing our series of new stories, explainers, and commentaries on diseases and conditions treated with HBOT, the state of the business of hyperbaric oxygen therapy, and treatment center news.